I’ve got a big thing about building stuff in a modular way. So I installed Fusion 360 yesterday, and I’m pretty impressed. Fusion 360 is a new SolidWorks competitor by Autodesk. Basically a $6k-8k CAD package, released free for hobbyists or businesses making less than $100,000 a year. That’s quite a hook. Especially considering how good it is already. It’s not quite at par with SW, but the feel is very similar, and I can see it eventually being a strong contender. Plus, you know, free. The parametric engine is also very good. I’ve been meaning to build a CoreXY platform for a long time. 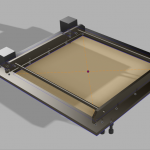 It’s an open source belt-driven CNC platform with balanced forces in the X and Y axis, an excellent build-area / platform-size ratio, and parts that are amenable to laser cutting. There isn’t a specific project it will go with, but you never know when you need to drop a CNC system into something. CNC everything! I’ve already purchased belt and pulleys ($10 for the cheapest GT2 belt, $10 for matching pulleys), and ideally, I’d be able to use the rest of those common items that I have kicking around, or can scavenge easily. That’ll change a little as I continue tweaking. All other measurements are derived from those. Now when I need a new system, I take stock of the motors, sheet material, and so on, and enter the values into the window. A laser cutter file magically appears on the other end. Here’s my project. It’s definitely subject to change. 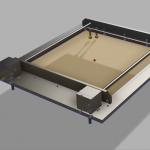 Accounting for laser cutter kerf is on the roadmap, and waterjet cutting would be good to design for, too, although I’m not super familiar with the constraints on that. The files are located in the cloud right here. The X carriage is coming in a few days when I’ve got a few minutes. This is also part of an ongoing project documented in this Vancouver Hack Space thread. One thing that I had problems with, is that Fusion 360 is not capable of reading parameters from subassemblies or parent assemblies. 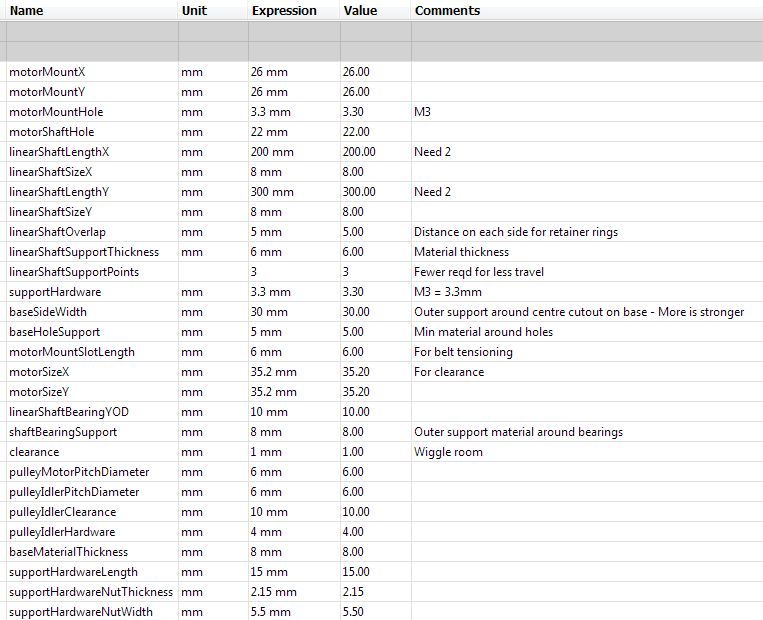 I had to copy the same set of variables to all of my parts, which is pretty annoying. Some internetting says that this feature will be implemented Real Soon Now(tm), as of 2014. A good help for that was an add-in called ParameterIO. It doesn’t work out of the box, though, there is a bug because of the dimensionless quantities in linear patterns. result = result + _param.name + "," + unit + "," + _param.expression + "," + _param.comment + "\n"
That allows you to export all of the user parameters, and also the model parameters as a CSV file. The same bug causes problems when you try and import! Fortunately you can delete the second half of the CSV file before importing, because the model parameters are a useless thing for unrelated parts. An add-in to automagically inherent all parameters from parent assemblies would be awesome, and fairly straightforward, from the looks of things. Maybe this feature already exists and I just haven’t found it, or maybe I will have to work on it when I’m done the X axis of this thing.